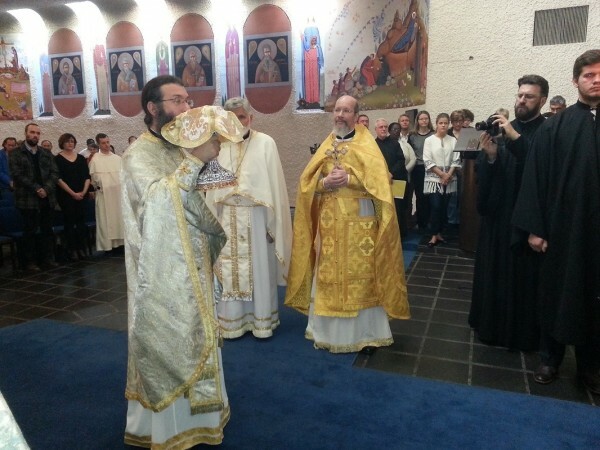 On 11 October 2015, the 5th Pan-Orthodox Pre-Council Conference opened with the Divine Liturgy celebrated at the Orthodox Center of the Ecumenical Patriarchate in Chambesy near Geneva. With the blessing of His Holiness Patriarch Kirill of Moscow and All Russia, the Russian Orthodox Church is represented by Metropolitan Hilarion of Volokolamsk, chairman of the Moscow Patriarchate’s Department for External Church Relations (DECR), head of the delegation; Archbishop Mark of Berlin, Germany and Great Britain, Russian Orthodox Church Outside of Russia (ROCOR); archpriest Nikolai Balashov, DECR vice-chairman; archimandrite Irenei (Streenberg) of the ROCOR Western American diocese; and the Revd. Anatoly Churyakov, DECR interpreter. The Divine Liturgy at St.Paul’s Church was celebrated by Metropolitan Jeremiah of Switzerland (Ecumenical Patriarchate), secretary for preparation of the Holy and Great Council of the Orthodox Church, and heads and ordained members of the delegations of the Local Orthodox Churches. Praying at the divine service and taking Holy Communion were Metropolitan John of Pergamon (Ecumenical Patriarchate) and members of the delegations. Prayers were offered and hymns sang in the Greek, Arabic, Church Slavonic, Serbian, Albanian, Czech, French and English languages. The 5th Pan-Orthodox Pre-Council Conference has been convened in compliance with the decision of the Synaxis of Primates of the Local Orthodox Churches held in Istanbul on 6-9 March 2014 with the purpose to consider draft documents of the Pan-Orthodox Council edited by the Special Inter-Orthodox Commission and also to adopt a draft document on ‘Autonomy and the Order of its Proclamation’ elaborated by the Inter-Orthodox Preparatory Commission in 2009. The 5th Pan-Orthodox Pre-Council Conference begins its work by a plenary session on October 12.